Back in 2013, I shared a few maps and models from the New York State Fair. Many times the projects behind them never get past that fancy looking stage. Today, I want to share with you one of those models which did come to life over the recent 4th of July weekend. 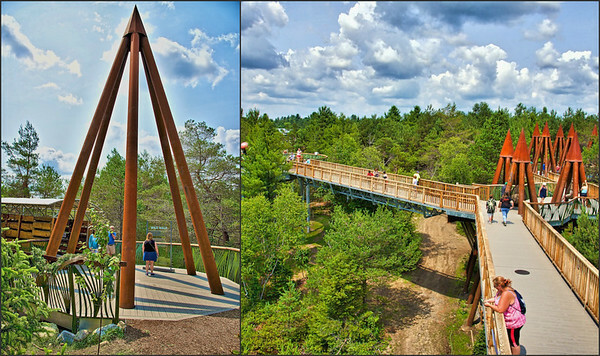 Views of the Wild Walk at The Wild Center in Tupper Lake, New York which opened over the 2015 July 4th holiday weekend. Both photos where enhanced with MacPhun’s Intensify Pro software. The Wild Walk takes guests thirty feet into the tree tops for a new perspective of the forest. Along the way, they learn about the birds, animals and insects which create the Adirondack biome. 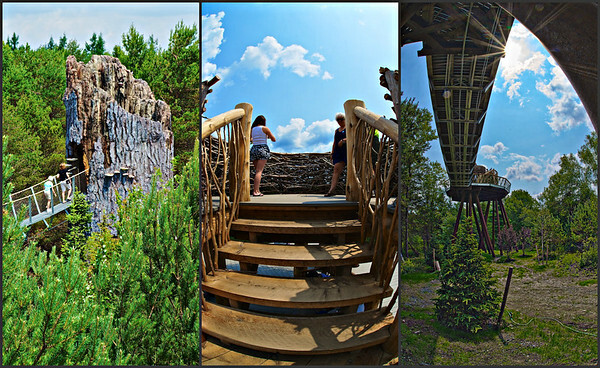 Scenes from the Wild Walk at The Wild Center in Tupper Lake, New York (from left to right): People walking into the Snag, people in the Eagle’s Nest and a view from underneath the structure. People can visit a larger than life Snag which shows how wildlife take advantage of dead trees for food, shelter, nesting and storage. The Eagle’s Nest is the highest point and gives a bird’s eye view of the surrounding Adirondack mountains. From underneath the structure you get an idea of the thirty foot height of the Wild Walk. There are interactive activities for both adults and kids to try along the Wild Walk. The most fun was the Spiders Web. There, entire families were having fun crawling about and jumping on a representation of a giant spider’s web high above the forest floor. 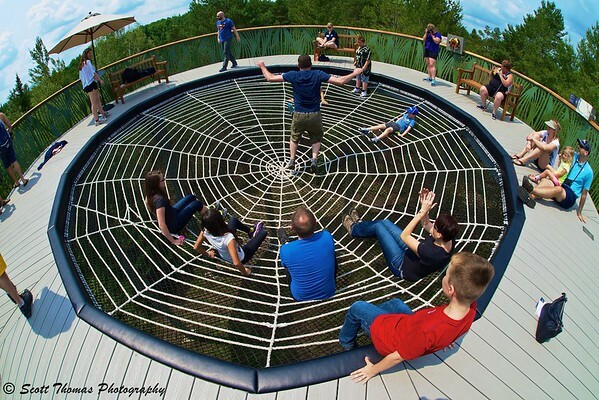 Families enjoying the Spiders Web on the Wild Walk at The Wild Center in Tupper Lake, New York. Nikon D750/Sigma 15mm Fisheye, 1/250s, f/16, ISO 900, EV +0.3. The Wild Walk is part of The Wild Center near Tupper Lake in the center of New York’s Adirondack Park. Families can make a day of it by bringing a picnic lunch or eating at the center’s snack bar. To plan your visit, head over to the Wild Center website. This entry was posted in Nature, Travel, Weekly View and tagged adirondack, adirondacks, adults, chldren, eagle's nest, families, family, fisheye, intensify pro, kids, macphun, new york, nikon D750, park, sigma 15mm, snag, spiders web, tourists, trees, tupper lake, wild center, wild walk. Bookmark the permalink.